60th Birthday Gag Gifts Are A Kick In The Pants! Are a Kick in the Pants! 60th birthday gag gifts. . .
60th birthday gag gifts get a party going! When someone turns 60. . . it's a BIG Deal! If you've ever been to a 60th birthday party, you know how much the stupid gifts play a main part of the fun. It's similar to a celebrity roast. The guest of honor starts opening the gifts and the fun begins. Pretty soon they'll be wearing funny hats, stupid shirts, and laughing over being told they're getting old. Depending upon their personality, they may or may not wear their gifts after the party! You can also get really creative and combine one of their hobbies with the gag gift. Do they like to play golf? How about fishing? Either hobby is a perfect match with a funny gift. Giving a gift that is reminiscent of the '50s is a great idea. Just think about it. . . What's different between 1950 and now? Lots! How much were cars, houses, groceries? What were the headlines? These are unique books that will bring back lots of great memories. Who doesn't get nostalgic when they see their favorite long time forgotten candy? Getting the birthday girl or boy to remember the candy they ate as a kid is fun! My favorite was Milk Duds and Sweet Tarts! Remember Atomic Fire Balls, Sugar Daddy, Tootsie Pops, Tootsie Roll, Root Beer Barrels, Good & Plenty, Chick-o-Stick, and Smarties just to name a few. You can also order your favorite retro candy below. Sure to bring a grin and a smack!This present will bring back sweet memories! You can still find lots of retro candy and toys. All would make perfect 60th birthday gag gifts. Retro Toy Gag Gifts. 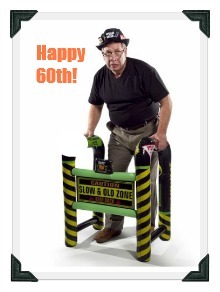 . .
make great 60th birthday gag gifts. Would they get a kick out of a retro toy? What was their favorite toy? A slinky, a paddle ball, and please don't forget the Whoopie Cushion. My favorite old toys were: Gumby and Pokey, jacks, Frisbee, slinkee, sparking space guns, super balls, silly putty and mini pinball games! Any of those would make great 60th birthday gag gifts. 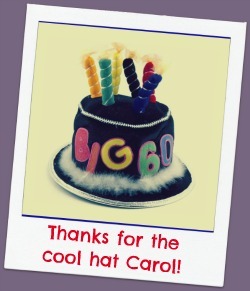 60th birthday cards should include 60th birthday humor or 60th birthday sayings. Sixty-year-old, one owner, needs parts ... Make offer. "I'm sixty years of age. That's 16 Celsius." By George Carlin.